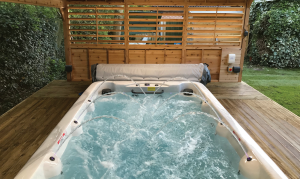 Lincolnshire based, Hydro-active Pool & Spas took on this turnkey project for the supply and installation of a Vita XL4 swim spa, in ground with bespoke cedar enclosure, paving and turfing last summer. 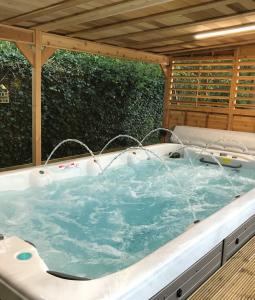 The customer wanted a focal point for their grandchildren to enjoy the benefits of swimming, whilst under the supervision of the grandparents, who were both keen swimmers and waiting to help develop their children’s swimming abilities. 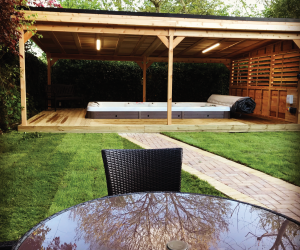 They also wanted to make use of a dead space in their garden but without the expense of constructing a pool indoors. 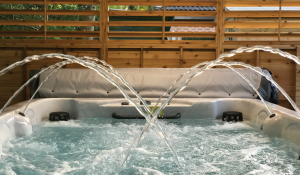 After trialling the swim spa in Hydro-active’s Armthorpe showroom in Doncaster, they decided that the swim spa in a building, offering the option, of fully open or fully closed for winter, would be ideal. The importance of avoiding planning permission was paramount, therefore particular attention was given to the design nature as to conform with permitted development rights. The building has optional sides that would fully enclose it, if the customer so desires. Hydro-active’s Andy Price reported that not everything went quite to plan. “We found issues within the excavation of water lines, not marked or indicated from an old building and electrical cables, again from an old structure located just off site,” he explained. Vita XL4 Setting: Concrete plus concrete blocks, cedar building, tanalised timber deck. Water treatment: O-Care plus chlorine Budget: £45,000 “These items were thought up have been made defunct many years ago, but were still operational. “We re-routed and reconnected both without any further action or cost to the client. With added extras to the building design to enhance its appearance, not charged for either, ensured that we exceeded the customers’ expectations.” Through clever sourcing of materials and utilisation of their own trades, the Hydro-active in-house team of four, cut on labour and material costs. They re-used and re-screened the spoil adding reclamation value to cover spoil removal costs.